This is the king of cookies: irresistibly soft and chewy with a decadently gooey dark chocolate filling. Our guests have never been able to eat just one – even though they are supremely rich and somewhat messy! Chill the truffles in the freezer overnight. In the large bowl of a stand mixer, cream the butter with the brown and white sugars. Add the eggs one at a time. Add the vanilla extract. Finally, with the mixer running on low, add the dry ingredients and mix just until they incorporated. Add the chocolate chips and stir them by hand. Cover and chill the dough for at least half an hour in the refrigerator. Preheat the oven to 325 degrees Fahrenheit. 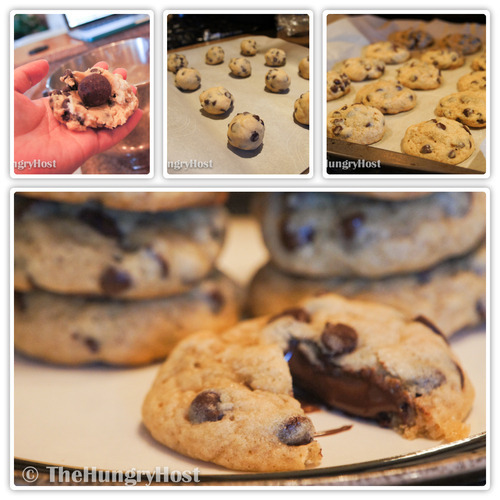 To form the cookies, scoop a rounded spoon of dough (about 2 tablespoons worth) and flatten it slightly in your palm. Place a chilled truffle in the centre and wrap the dough around the truffle, rolling it slightly to make a sphere without gaps. Bake the cookies at 325 F for 14-16 minutes. They’re done when the cookies are just turning golden along the outer edge. Let the cookies cool on the baking sheet. These are best enjoyed slightly warm! These look great, Linda! So glad you enjoyed the recipe!